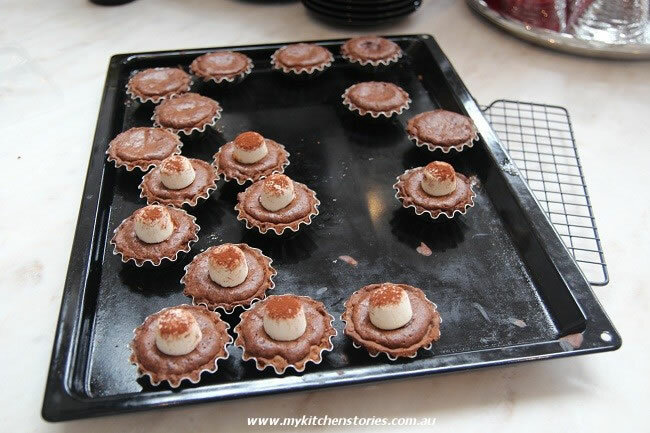 The first time I tried this moussy chocolate tart filling I was very happy, because I new I had found a recipe I would use for a long time. ( that was at least 10 years ago) It is a lightly cooked version of a chocolate tart that can be eaten warm if you can’t wait. This recipe involves three steps. I have been asked by a number of people to post it as, I think they enjoyed eating them. 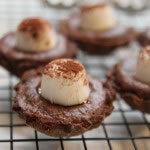 Even , Skater likes these chocolate tarts which is a minor miracle in itself . This recipe makes quite a large amount of pastry. Cut it in 1/2 and freeze for next time . It is delicate to work with but it is the most beautiful pastry. Beat the butter and powdered sugar until light. Add the eggs and mix well. Add the sifted flour and cocoa and mix till just combined. Turn on to a bench and push together into a disk. This pastry is very soft and needs to be chilled till firm. Take it out of the fridge and leave till just softening. You will need to work quickly and flour the bench well. Alternatively use baking paper to help roll it out thinly as possible. If holes form it can be pushed together to cover, but do this well, over lapping and keeping it chilled and thin. 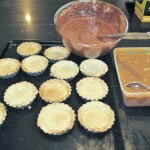 Roll out, lining 12 - 18 small or 6 medium individual tart tins ( yes you can make 1 medium sized one). Rest again in the refrigerator 15 minutes. Blind bake till golden. Cool . Put the sugar into a heavy saucepan along with the water and lemon juice. 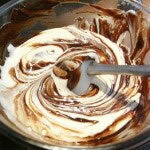 Swirl the pan to coat the sugar completely. ( try not to stir the sugar, it will encourage crystalization). Put the pan onto medium heat and watch, only swirling occasionally until it starts to colour. Watch it carefully from here. Let it get deep dark golden brown then take off the heat. 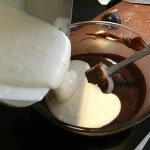 Carefully add the cream and whisk to combine. The cream will bubble up, before subsiding . Be very careful of the steam and the heat in the sugar syrup. Add 1 teaspoon of the salt and whisk to combine. 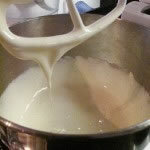 Now add the butter a few cubes at a time, whisking it into the caramel. Once all of the butter is incorporated test for salt again. It will take up to another 1/2 a teaspoon but add to your taste. Put into a container and cool. (best straight from the fridge for this recipe). Melt the butter and chocolate together and set aside while you beat yolk, egg and sugar till light and creamy ( I use the stand mixer). This lightness gives the mixture its moussey lightness so beat it till white and fluffy. 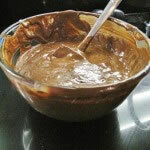 Fold the two mixtures together till combined. 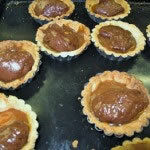 Put a 1/2 teaspoon of ( chilled)caramel into the bottom of each tart case, spreading well. Spoon chocolate mousse onto each tart till 3/4 full. Put the tarts onto a tray and bake at 160 ( 320 F) degrees for 10-12 minutes. The tarts should still be soft . 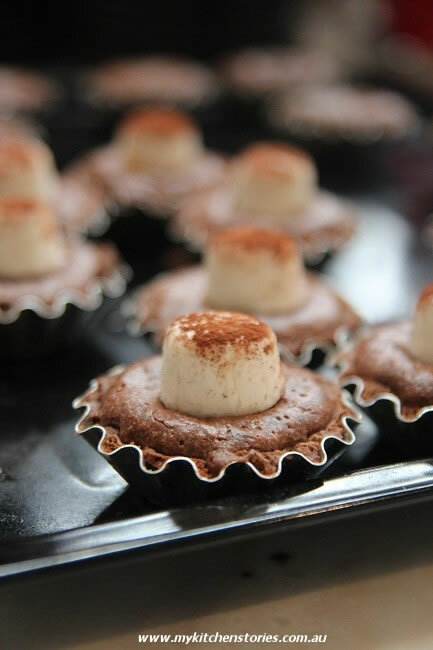 Cool and dust with cocoa and place a 1/2 marshmallow on top. This recipe will make 10 times more caramel than you need. Use it with ice cream, mixed with cream for cake fillings, drizzled over a warm cake or as a glaze over hot fruit and frangipane tarts. Do you have a favourite chocolate recipe or a very fussy child? It’s no wonder when you see gorgeous desserts like these exactly why salted caramel is so insanely popular all over the world. What a love presentation of a lovely recipe. Well, these certainly look tasty enough to be $15! Gorgeous tarts! So scrumptious. I love salted caramel. You are chilled and thin Rebecca! Not only do they look gorgeous but I can testify that they do taste gorgeous- makes your knees go weak with every mouthful…You are a master choc wizard miss Tania! Now this is why I haven’t been blogging as much lately; my waistline can’t take it! Your tarts are to die for. I thought you were quiet, thin up and come back! They look fabulous! The marshmallow garnish looks so adorable. These look wickedly bad for my hips, but heaven on the lips!! Everytime I read your blog lately I start craving something sweet! 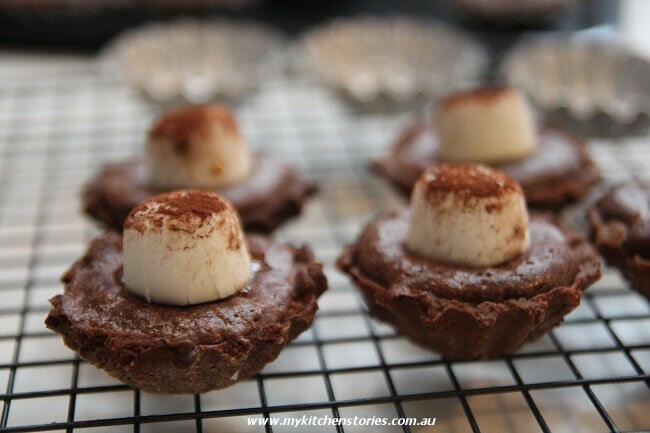 These little tarts are gorgeous! Wow, these Tartes look so yummy! Hello Verena, thank you for looking !! 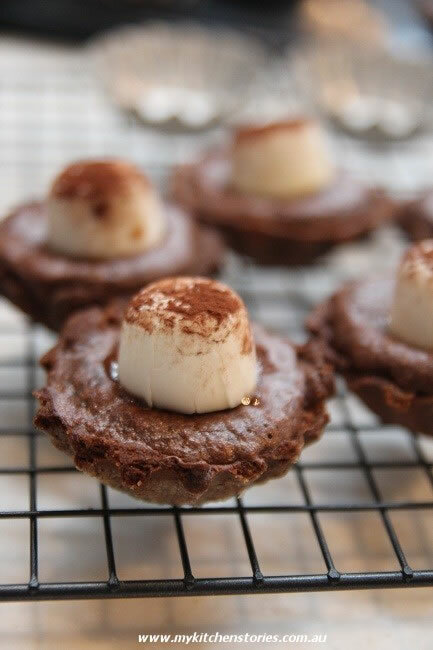 is it wrong that my favorite thing about these magnificent tarts is the finishing touch of a marshmallow on top? brilliant! These look amazing! Chocolate, salted caramel, and marshmallow…in my opinion, these are priceless. Just the perfect timing for Easter Tania! This looks delicious! What a great recipe – I can’t wait to try it! Hello Kristin, I hope you do try it and let me know how you went! And I hope to learn a bit from you! Oooh, that cheeky monkey, he’s lucky he ever got dessert again! 🙂 Lovely recipe, Tania! Hope you’re all having a wonderful Easter! The recipes looks and sound gorgeous. Here in India some of the bakeries, “over-salt” their salted caramel tarts. Too much of their salt takes out the sweetness out of it. The amount mentioned here sounds perfect. I will have to give it a try 🙂 Thanks for sharing again.